Whether the roof of your home is made of shingles, tiles, copper or other roofing materials, your roof is your home’s primary defense against weather and the elements that can cause costly damage to your home and what’s inside it. Your roof has a safeguard against water intrusion, your rain gutter system. Installing reliable roof rain gutters and maintaining an adequate drainage system can go a long way toward preserving your roof and other moisture sensitive parts of your home, like walls and foundation. Roof gutters are mounted along the edge of the roof and provide a direction for rain, melted snow, and other runoff to flow off your roof through a downspout and safely away from the foundation of your home. Specifically, runoff is directed away from your roof, attic, walls, foundation or other areas around your home where collecting water could cause rot, mold and other structural damage. There are several points to consider when choosing roof gutters for your home. It’s important to consider quality and performance and understand what works best for your type of home and your location. But rain gutters are not just utilitarian anymore. You can also choose styles and materials that not only serve a useful purpose but can also benefit the look of your home. Roof rain gutters come in numerous shapes, materials and sizes. 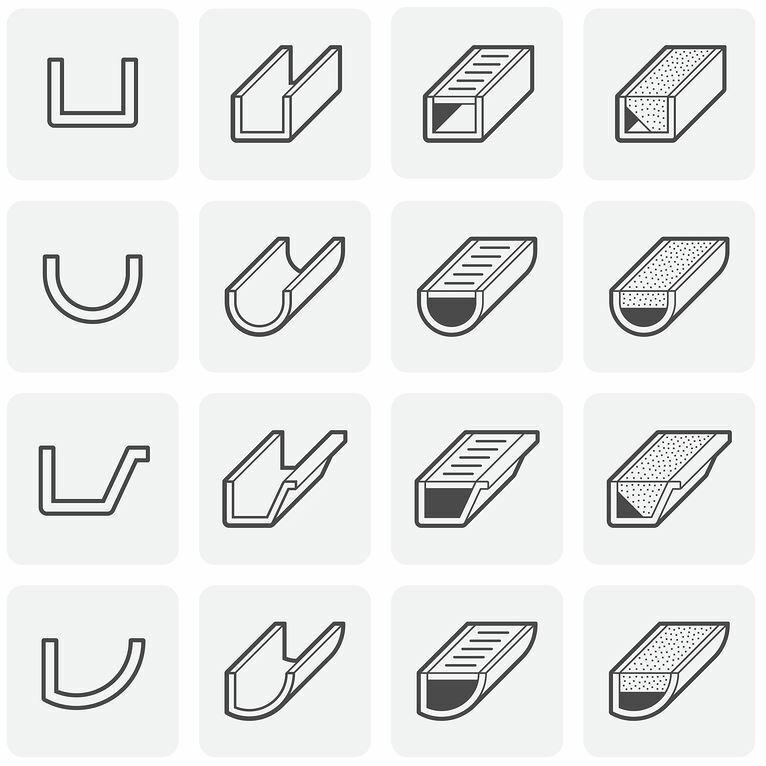 Two common designs are ‘K’ style gutters and half round gutters. While both shapes come in a few different widths that allow for a certain capacity of drainage, the shape of the ‘K’ Style roof gutter will handle a larger capacity of drainage than the same size half round shape rain gutters. If you’re the DIY type, you’ll need to buy components that comprise all the parts you’ll need, including gutters and downspouts as well as the gaskets that form watertight junctions between them. The gutters come in various sizes, including 4, 5 and 6 inch diameter. You can get matching downspouts in different widths, including 2×3 inches or 3×4 inches. The larger the size the better; it’s worth the minimal difference in price to go with the larger size as wider gutters and downspouts will tend to clog less and thus perform better and be easier to maintain. What Type of Material Should I Choose for my Roof Gutters? There are several points to consider when choosing the material for your roof rain gutters. The material you choose not only affects the cost of the installation, but also the level of protection the roof gutters provide to your home as well as the look and curb appeal of the home. Vinyl – The most common roof gutter material option for roof rain gutters is vinyl. Vinyl is not only a durable material, but it is also rust-proof and easy to maintain. This cost-effective option is good for the tightest of budgets and will function well and last in a wide variety of climates and regions. Steel – Steel is a good choice for high quality roof rain gutters that can last in the elements but can also handle falling branches and other debris that can cause structural damage to a roof gutter system. Steel is competitive in cost to other materials when quality and durability is considered and can be worth the added expense in regions or on lots with a lot of tall trees and high winds. Aluminum – Aluminum is a cost-effective choice for your roof rain gutters and comes in several different gauges of thickness. Aluminum is a long-lasting material. Corrosion can be prevented with proper maintenance and it is resistant to rust. Aluminum roof gutters provide an installation option that other materials do not. They can be installed in sections with joints about every ten feet or you can choose seamless aluminum roof rain gutters. Seamless roof gutters need less maintenance and are less likely to develop leaks because the gutters are put up as one continuous section. There are no joints where debris can accumulate, or where moisture can freeze and cause cracks in colder weather, making this a great choice for colder climates. Copper – A popular choice for beauty and durability is copper roof gutters. Copper gutters, while higher in price, are a good investment in your home as they add beauty, value and plenty of curb appeal. Copper will not rust and is resistant to corrosion. It will develop an attractive copper patina or verdigris over time as it ages. 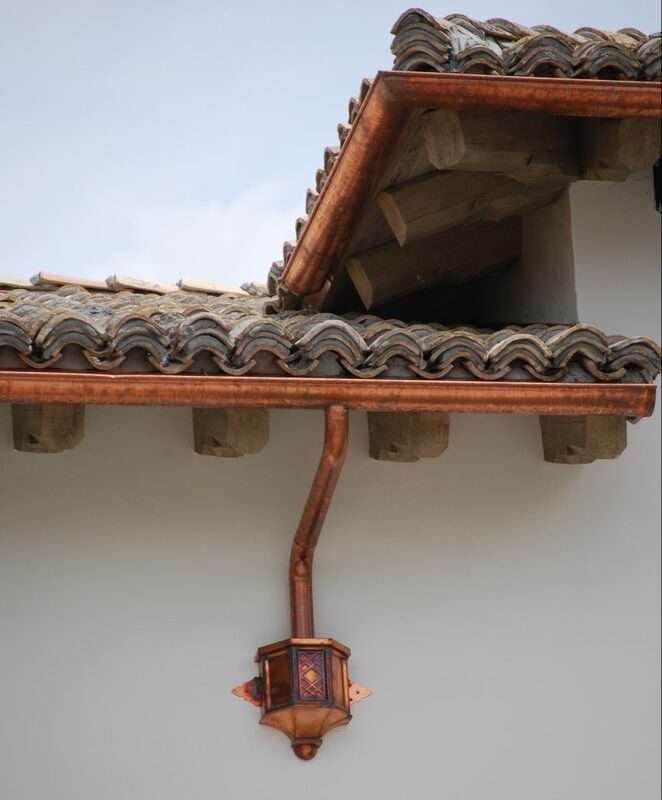 A copper rain gutter system is the perfect accompaniment to a copper roof so that they can complement each other and complete your home’s look. They also complement tile roofs and can provide decades of service. Copper’s strength, durability and classic beauty make this a good choice when design and functionality are both a priority. When Should I Replace my Roof Rain Gutters? Regular inspection and maintenance of your roof gutter system can help them do their job well and last longer. 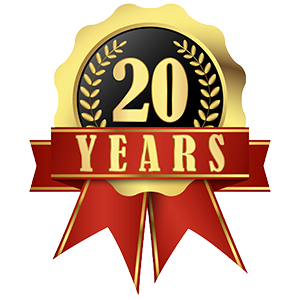 Rain gutters can last 10 to 50 years depending on materials and with proper maintenance. It’s important to know when your roof rain gutters are failing to get the job done and need replacement before your home suffers costly damage. 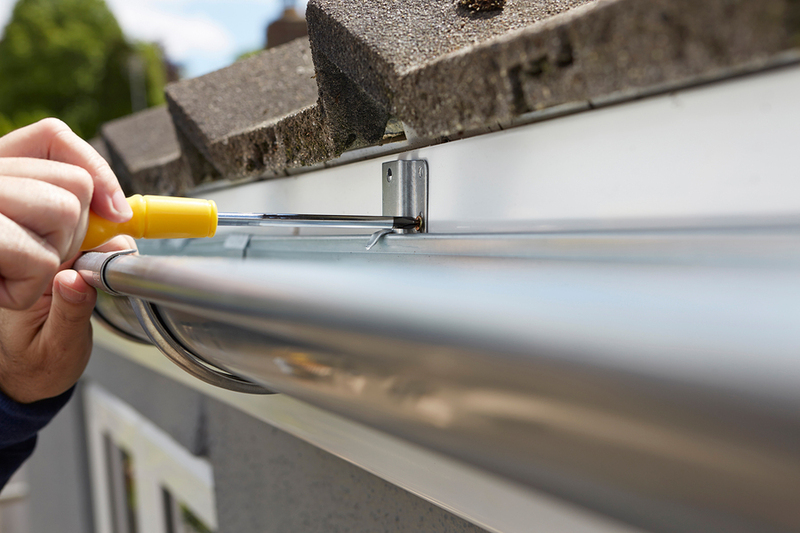 Regular inspection can help you avoid problems with your rain gutter system. One of the first things to look for when inspecting your roof rain gutters is sagging. If the roof gutters are sagging and not following the straight line of your roof, the integrity of the system is compromised, and water will not flow to the downspout. This can cause overflow in the sagging section that can damage walls, window casements and the foundation below. Collecting water will also cause rust, rot or freeze damage depending on the material. It is important to check your roof gutter system after storms. Flying debris can cause cracks or leaks and can even knock a section down. It is important to make sure all the components of the roof gutter are intact such as the drip edge. This small flashing edge helps direct water off the shingles and into the gutters preventing damage to the roof shingles and outer walls and windows of your home. Poor installation or advanced age may mean loose gaskets, missing hardware or broken parts. A full walk around and inspection once a year will help you spot and stop any problems from leading to system failure in a storm. Be sure to follow the line of gutters and downspouts and inspect and clear any debris out of the inside of the gutters, allowing you to fully inspect them inside and out. Finally, you want to make sure the roof rain gutters are installed properly and can handle the capacity of drainage for your region and home. While many roof gutters can be installed by a do-it-yourselfer, having your roof rain gutters installed by an experienced pro will assure the job is done properly and add to the life of your roof gutters. 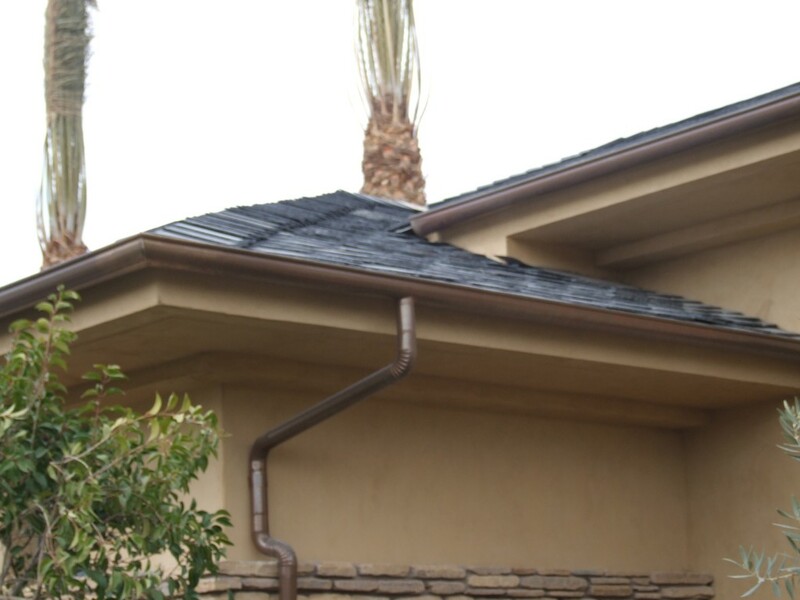 Contact Prestige Roofing serving Las Vegas and Southern Nevada for a free inspection of your rain gutter system.